Festival weddings are all the rage, and can take place in a licensed meadow or a field, giving you a blank canvas to create your own unique style of wedding with a personal touch. You might choose to have a themed wedding, letting your creativity and imagination run wild. You can find plenty of inspiration on the internet, Instagram and wedding inspired websites, all are a great place to start looking, and can help you along the way. First you need to find your ideal space where you can set-up a marquee, tents, yurts or a teepee; all are perfect in their own right, and a fun way of housing your wedding. 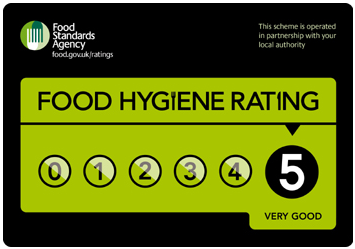 You may like to add pretty signs to direct your guests to the bar, entertainment, toilets or relaxing/ chill-out areas. These can be rustic or creative as your imagination stretches, and can be a great help in steering your wedding guests in the right direction. Why not start by designing your very own festival ticket style invitations, to set your wedding off to a flying start. Lighting is an important feature as it sets a magical atmosphere as the sun starts to set. You can never have enough fairy lights, the more sparkles the better, intertwined amongst vintage bunting adds a nice vintage touch. Fun foods such as street food, snacks and sweets are a fun and easy way to feed your wedding guests, along with a cool bar to fit in with your festival theme. 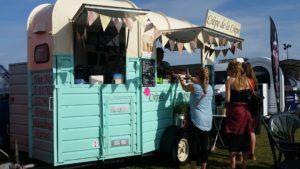 There are many cool and funky mobile catering units available to hire, which are ideal for catering at festival weddings. 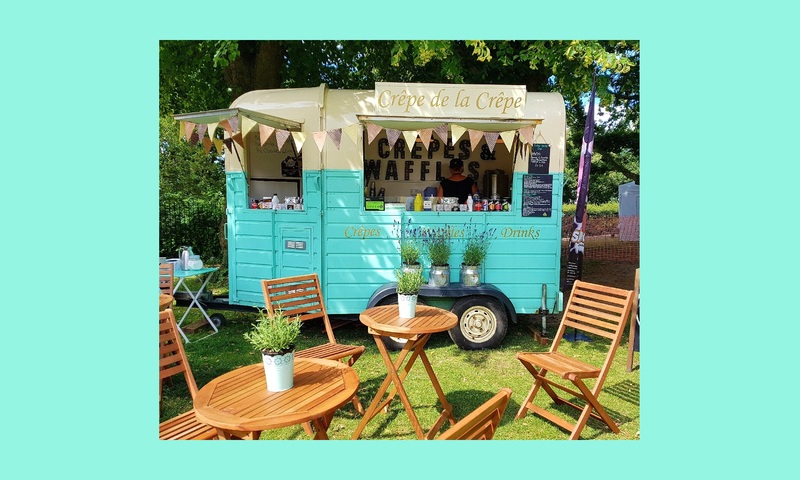 You could hire a vintage horsebox creperie, serving tasty freshly cooked crepes to satisfy your guests. 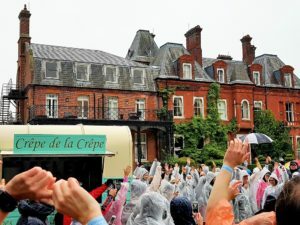 Take a look at Crêpe de la Crêpe menu for great wedding food ideas. 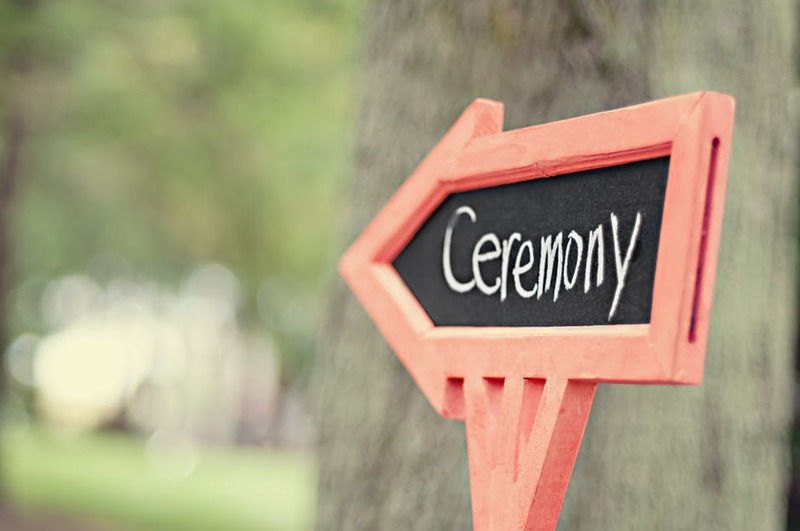 Festival weddings can often work out more affordable than conventional weddings, with some fields and meadows offering facilities for your guests to camp over-night too. This gives your guests a brilliant opportunity to let their hair down, mingle and party on down into the early hours to your chosen music, whether it be a hired DJ or live bands. 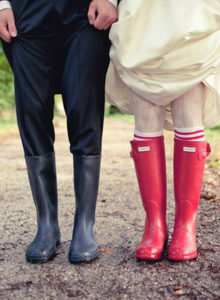 Why not go the full hog and order yourself some trendy wellies to fit in with your theme! Previous PostPrevious Crepes for Pancake Day!